This keyboard is for the serious gamer who is limited on space, but is looking for big functions. When you are serious about gaming, put those juvenile and ineffective keyboards aside from the CM Storm QuickFire Rapid Tenkeyless Keyboard. This keyboard design is for the serious gamer who is limited on space, but is looking for big functions. The performance of this keyboard gives gamers the advantage of only having to deal with the simplest of options. There are extra feature buttons for functions, but they are not necessarily needed to make this a highly user friendly piece of gaming equipment. Performance enhancing tools such as rapid fire and double function buttons make this compact model perfect for taking down enemies quickly. The design and structure of this keyboard supports the needs of the gamer. The compact design allows for comfortable typing and tight configuration for optimum gaming capabilities and control. The small and light design of this keyboard makes it easily portable. With a weight of only two pounds and five ounces, packing it in a bag or carrying it along is no problem. The slightly curved body of the keyboard offers the user the ultimate in comfort and function in one small compact multi-functioning gaming keyboard. The unique design of this model also offers a white backlight for illumination during play. Gamers can turn the brightness of the light to their choosing, from a dimly lit setting up to an extremely bright option. Other options for the lighting on this keyboard include a pulsating light, solid light, and a respond to touch setting. The built-in kickstands that are in place on the underside of this model set the board up at an extreme angle. However awkward it looks, the function and comfort are still very much present. 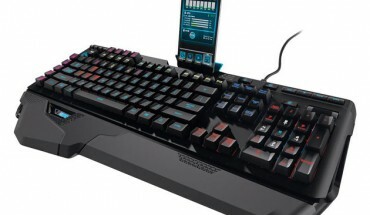 This keyboard gaming system allows the user to choose and create up to four different user profiles. Each individual profile can pre-set which keys will illuminate when that profile is active. For the instance where the gamer could use a rapid or repeat fire, there is a setting in which the player can select a repeat setting to function automatically between two and eight repetitions. Setting the firing repetition from one number to another is a simple task which can be done easily if one follows the enclosed instructions. 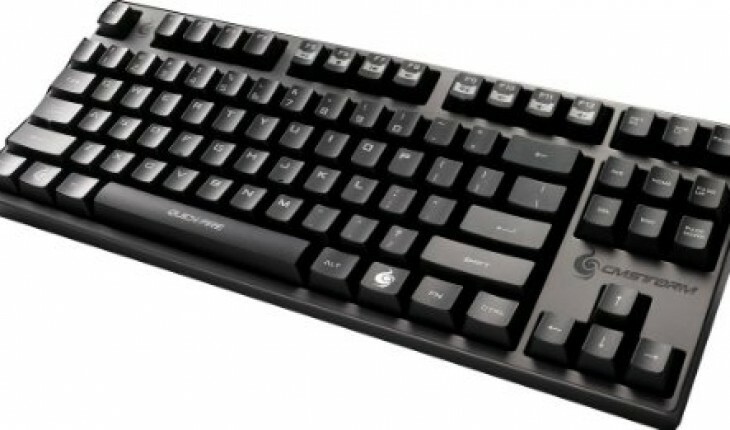 The keys on this CM Storm QuickFire Rapid Tenkeyless unit are slightly closer together than that of a standard keyboard. However, once the user acclimates themselves to this change, the average typing speed increases due to the simplicity of the system. Because of the compact size of this keyboard, many of the keys are multi-functional. A convenient function button allows the user to initiate the F-1 through F-12 keys. This allows the user access to functions such as backlighting and media control. 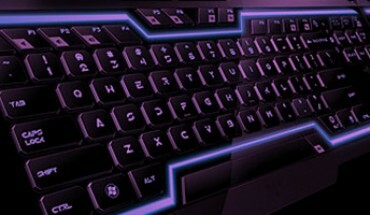 A few of the keys do not illuminate when the gamer utilizes the lighting function. Overall, the keyboard is easy to see, use, and navigate. The keys themselves have a concave shape and a matte finish which helps to keep the user’s fingers where they belong on the keyboard. The keys on this gaming board consist of all of the keys necessary for functional typing with the exclusion of the number keys. For most gaming situations, this is not a concern. Gamers will delight with this lightweight compact keyboard. Illumination of the keyboard with multi-functional buttons make this CM Storm QuickFire Rapid Tenkeyless keyboard a must have for the serious competitive gamer. Eliminate the excess baggage from your finger driven controller, and find your gaming experience enhanced by the lack of interference of unnecessary keys on your gaming keyboard with the CM Storm QuickFire Rapid Tenkeyless keyboard. 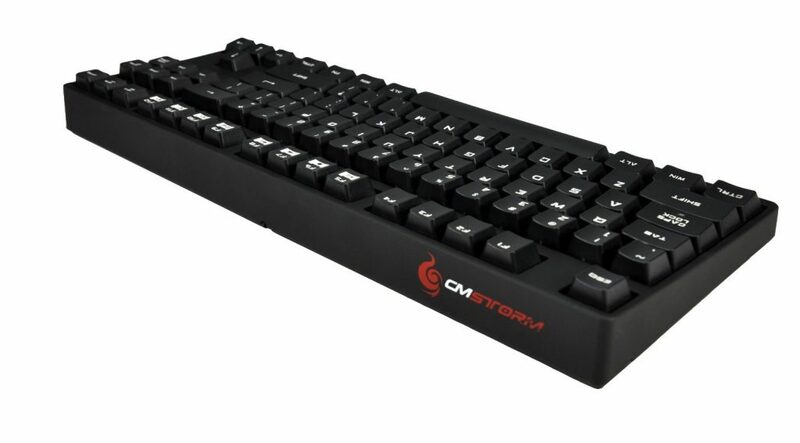 PROS: The CM Storm QuickFire is Streamlined and quite compact in design. Gaming performance is pretty awesome and is fast and really comfortable when you’re typing. CONS: There’s a few confusing extra features on the keyboard as well as a few inconvenient secondary controls. Lighting on the board is a bit hit and miss.